Dr. Maria Montessori believed that sensorial experiences began at birth. Through their senses, children are able to study their environment. Through sensorial work, children are able to consciously obtain clear information that allows them to make classifications in their environment. These classifications also work as stepping stones to organized intelligence, which leads to the ability to adapt to the environment. Sensorial activities in Montessori learning are specifically designed to aid children in discrimination and order, as well as to broaden and refine the senses. Sensorial work with Montessori designed materials helps prepare a child to be logical, aware and perceptive. The concept of sensorial work was developed by Dr. Montessori long before sensory play was adopted into practice. According to the Montessori philosophy, the child is the “sensorial explorer” and learns to perceive qualities through sensorial experiences. 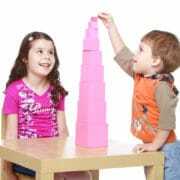 Montessori materials, like the Pink Tower in the photo above, are designed to aid in visual discrimination by allowing the child to recognize differences in dimension, width, length, and size. There are plenty of Montessori activities that enhance the visual sense, including the Brown Stair, Red Rods, Knobbed Cylinders, and Color Tablets. The tactile sense is also developed in sensory activities through the use of Touch Tablets and Fabric Feel, while the auditory sense is sharpened through the use of Sound Cylinders and Bells. The olfactory sense, in which a child learns to differentiate smells, is developed through Montessori materials like Scent Bottles, while the gustatory sense, in which a child learns to differentiate tastes, is developed through Food Preparation and food tasting. At Montessori Academy at Sharon Springs, we know that there is no limit to the amount of knowledge children may obtain during their formative years. Between birth and age 6, we know how important it is to develop a child’s senses. For this reason, we place emphasis on helping children understand the world around them. In the classroom, we implement sensorial work and use the proper activities to develop logic, awareness, and perception.